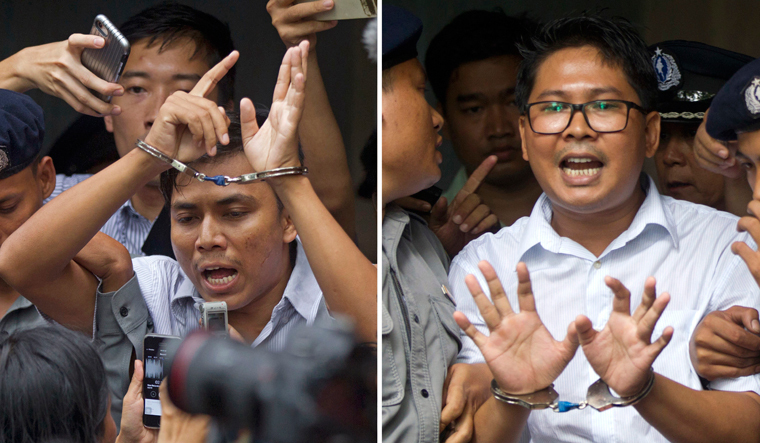 Putting the spotlight on the country again, a court in Myanmar has sentences two Reuters journalists to seven years in prison for violating a state secrets act while investigating violence against Rohingyas. The case is being seen as a test of press freedom in the country. Wa Lone, 32, and Kyaw Soe Oo, 28, were sentenced by district judge Ye Lwin, who said that the duo has breached the colonial-era Official Secrets Act when they collected and obtained confidential documents. But the journalists have maintained their innocence saying they were set up by police. They claim that the documents were given to them by police officers. "I have no fear," Wa Lone, one of the two journalists, said after the verdict. "I have not done anything wrong. I believe in justice, democracy and freedom." The two men, who both have families with young children, have been in prison since their arrest in December 2017. Both of the journalists are Myanmar citizens who were working for the international news agency. The duo had been investigating the execution of 10 men by the army in the village of Inn Din in northern Rakhine. During their investigation, they were offered documents by two police officers, but were arrested immediately afterwards for the possession of those documents. Authorities later launched their own probe into the killings, confirming the massacre took place and promising to take action against those who had taken part. The UN's resident and humanitarian co-ordinator in Myanmar Knut Ostby said the UN had "consistently called for the release" of the journalists and that "a free press is essential for peace, justice and human rights for all. We are disappointed by today's court decision". The verdict had been delayed once because of the judge's ill health. The ruling comes a year after the crisis in Rakhine state came to a head when a Rohingya militant group attacked several police posts. The military responded with a brutal crackdown against the Rohingya minority. Media access to Rakhine is strictly controlled by the government so it is difficult to get reliable news from the region.